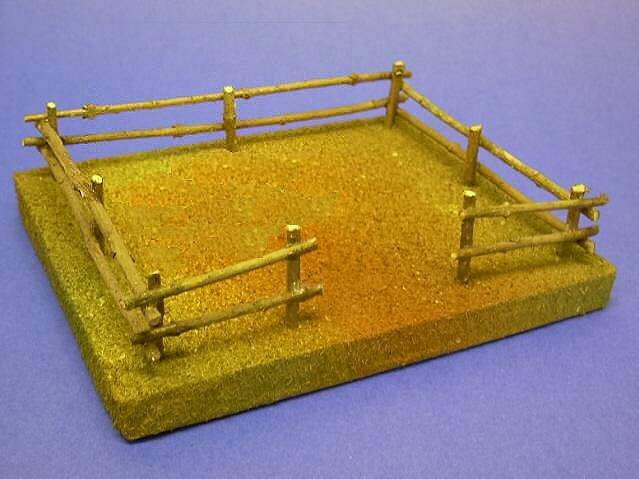 Note from Editor: Project designer Howard Lamey has made whole villages of vintage-style cardboard structures. This project is one result of me sending him a "care package" with many printed sheets from the Resources page. Howard was already building these little barns for friends, but he was newly inspired when he received my "building texture" sheets. This is what he sent me. 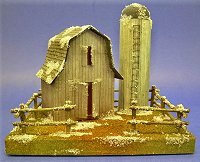 This barn and silo are proportioned to look right with "Christmas Villages," both the new ceramic and resin kind, and the original cardboard and celophane kind that was especially popular between World Wars. It is not quite a "glitterhouse," because the walls and roof are finished with printed graphic paper instead of paint and glitter. However most of the construction is very similar to building a glitterhouse, so we will refer to articles on glitterhouses in general from time to time. Some means of spraying light brown and light green. This could be paint cans, or a spray bottle you can use with acrylic paints. 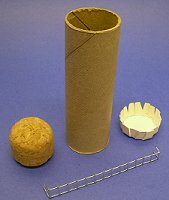 A piece of tube from a paper towel or wrapping paper roll for the silo. Supple twigs for the fence and fence posts. Yellow vellum, celophane, or similar translucent medium, if you plan to illuminate the barn. 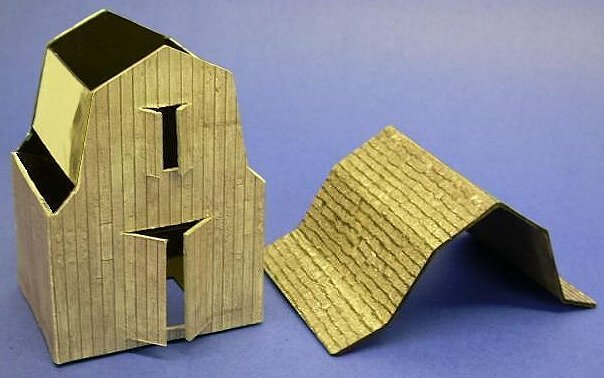 This project has a structure pattern that you will need to cut out and transfer to cardboard, as well as three texture sheets that you will use to finish your barn's appearance. Printing the Patterned Paper - The patterns used on this barn are from the Big Indoor Trains™Building Texture pages. If you would like to try a different pattern, please check them out. In the meantime, the following patterns will give you the same graphics used in this project. Print each on acid-free bond paper at the highest quality setting your printer allows. T111 Siding, as used on the barn walls. Rough cedar shakes, as used on the barn roof. Faded white painted barn siding, as used on the silo. The base is a rectangular "box" that is decorated before the barn and silo are installed. It should be about 5" x 6" x 1/2". When the glue has dried. Drill holes in the base to fit the twig fence posts. Paint the base with an acrylic beige paint. Spread the Elmer’s Glue-All over the top and sides of the base (except for the holes) and sprinkle sawdust over it. Press the sawdust into the glue a little and make sure there aren't any major "holes" in coverage. Then set the base aside and allow it to dry. "Mist" the sawdust with light brown and green, and any other colors you would like to try. Use a random pattern. 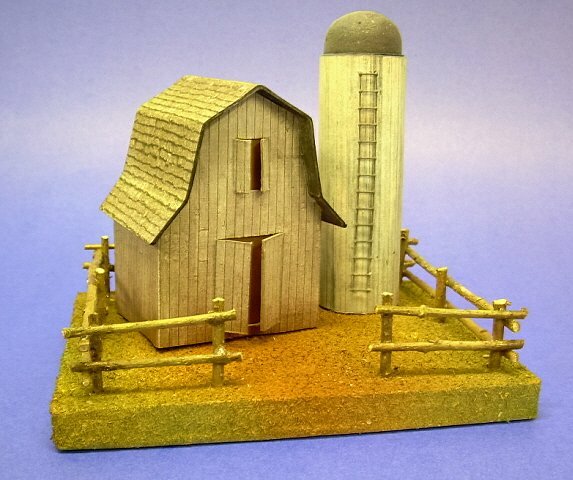 The barn and silo, and any accessories are glued on later. 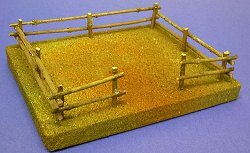 Glue twig fence rails to posts. Clothes pins make good clamps. You can also tie rails to posts with dark color buttonhole thread and apply glue. Score the fold lines of the barn walls, then cut out that piece and fold on score lines. You may paperclip the barn together while you are testing the roof if you wish. Cut out the roof piece. Score only the fold for the peak of the roof at first. Put the peak of the roof on the highest part of the barn walls and work outward, checking fold locations by actual roof line measurements. You may have to make more than one roof to get best fit. Paint the exposed edges of cardboard that will not be covered when the printed siding and roof are applied. Paint the underside of roof overhang plus back of hayloft and barn doors. Paint the inside of the barn black. Apply the printed graphics of siding and roof. Do a section at a time. 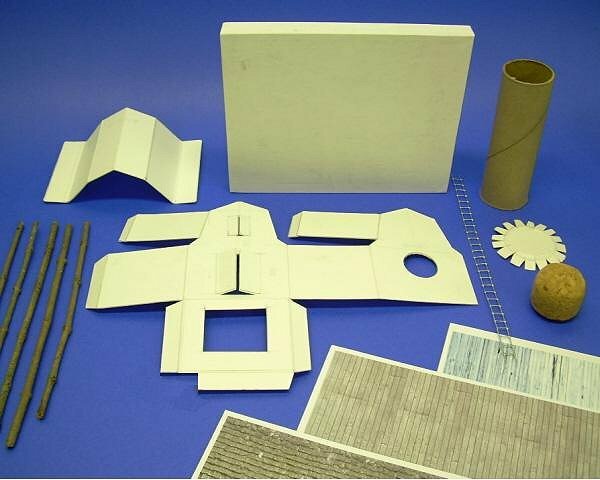 Measure carefully, make crisp folds, apply glue and press in place. You're better off leaving the graphic paper a tad long than a tad short. Assemble barn; let it dry, then glue on the roof. If you plan to illuminate the barn, install yellow or orange velum behind hayloft and barn door openings. The silo body is section of cardboard tube from a paper towel or gift wrap paper roll. Glue the silo base disc inside the lower edge of the silo body. Glue the printed graphic siding to the outside of the silo body. The roof can be a pointed cone rolled from cardboard, a foam ball from craft store or ping-pong or rubber ball if the diameter is right for silo body. The silo roof shown was made from a piece of cork. Prime and paint the silo roof and glue it in place. 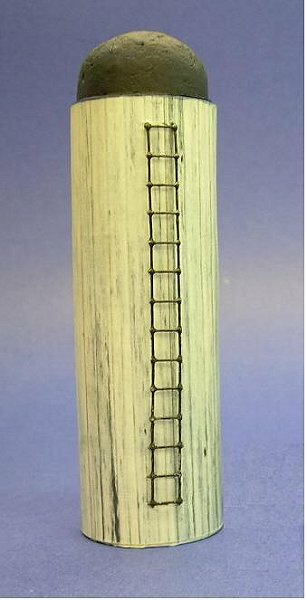 The ladder is made from a strip of 1/4-inch hardware cloth. When you cut the piece out, leave four short wires sticking out the ends so you have something to attach to the silo. 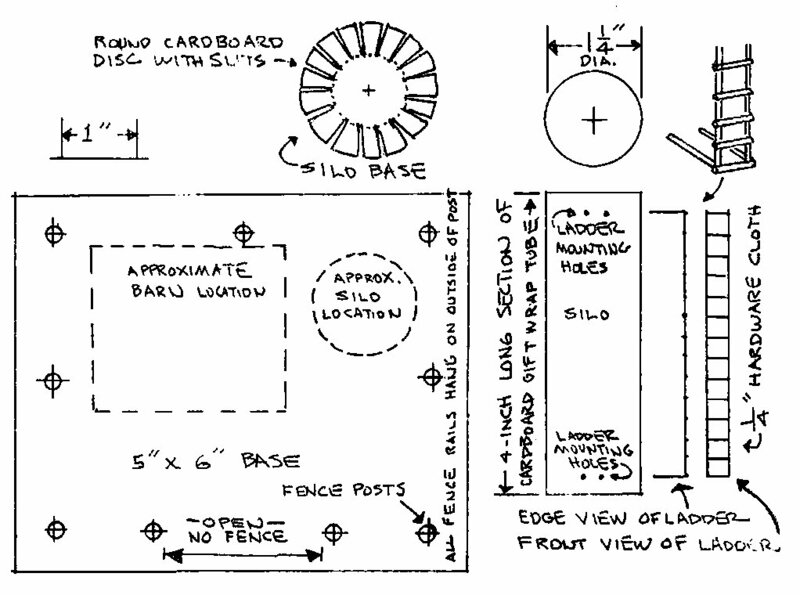 Punch small holes in silo body to receive ladder rail extensions as shown on drawing. 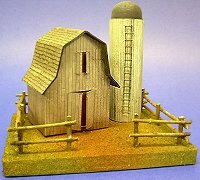 Spray the silo all over with fine mist of gray primer and spray the bottom edge with fine mist of the brown spray you used on the base. 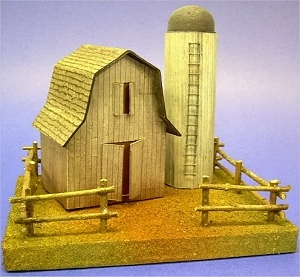 Glue barn and silo to base. 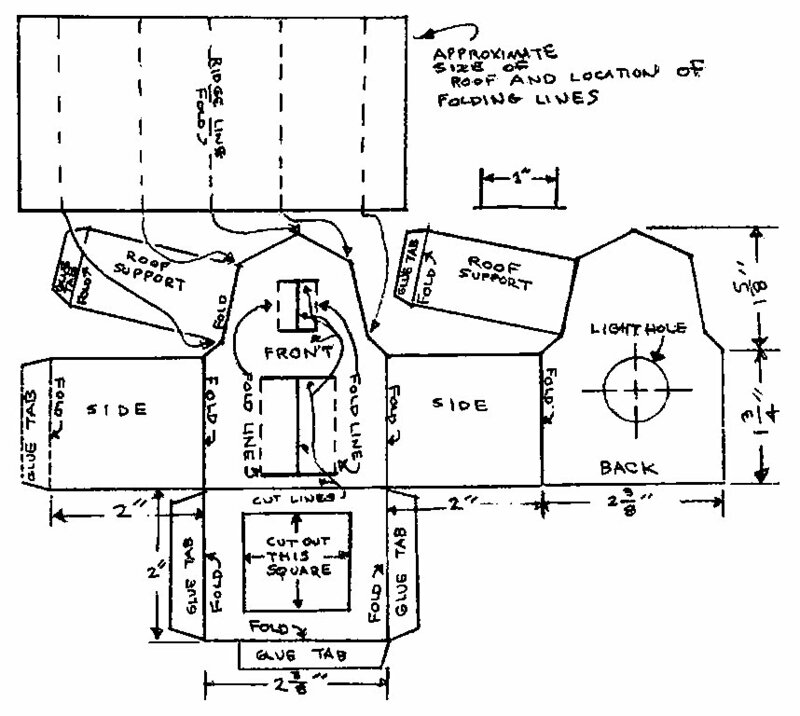 Note that barn location is just slightly different angle than drawing. This was done to create “visual interest“. 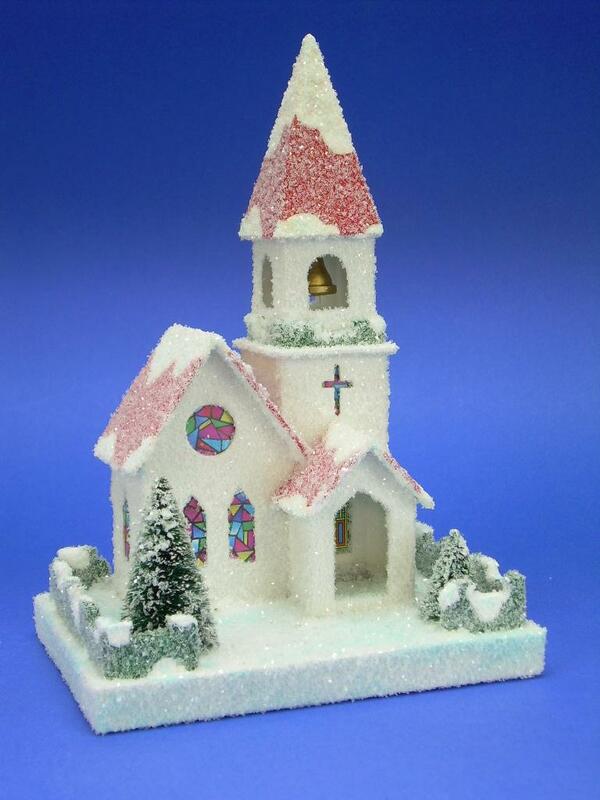 If you want to use this building with Halloween or Christmas villages, you can add some frost. When everything is glued together and the glue has dried, use clear glitter sprinkled over Elmer’s Glue-All to add little touches of frost on the roof, chimney, fence, and base. 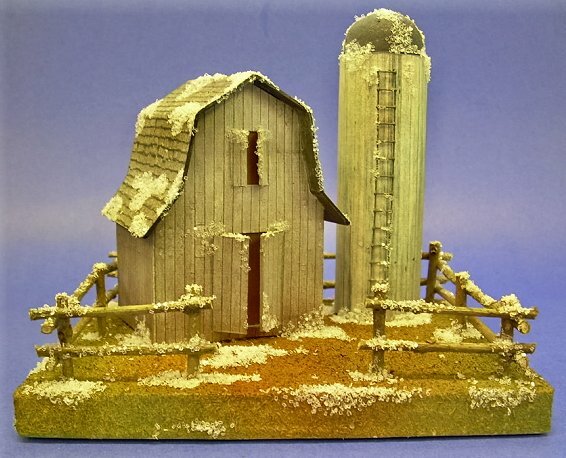 I can still use the barn and silo in my “Pine Mountain Valley” Christmas display village and railroad just by adding a handful of artificial snow to the roofs and base. Would You Like to See Your Own Design Built Up? Now that I'm in "retirement," this hobby has become a sort of avocation for me. Several folks have commissioned me to build specific houses for them. So if you'd like me to "bid" on a cardboard house for you, or if you have any questions at all, please use this link, and I'll get back to you. To Return to the Howard How-To's Page, click here. Note: LittleGlitterhouses.com™ and Spook Hill™ are trademarks of Howard Lamey, North Jacksonville, Florida. Big Indoor Trains™, Big Train Store™, Family Garden Trains™, Big Christmas Trains™, Garden Train Store™, and Trains and Towns™ are trademarks of Breakthrough Communications (www.btcomm.com). All information, data, text, and illustrations on this web page are Copyright (c) by Paul D. Race and or Howard Lamey. Reuse or republication without prior written permission is specifically forbidden.